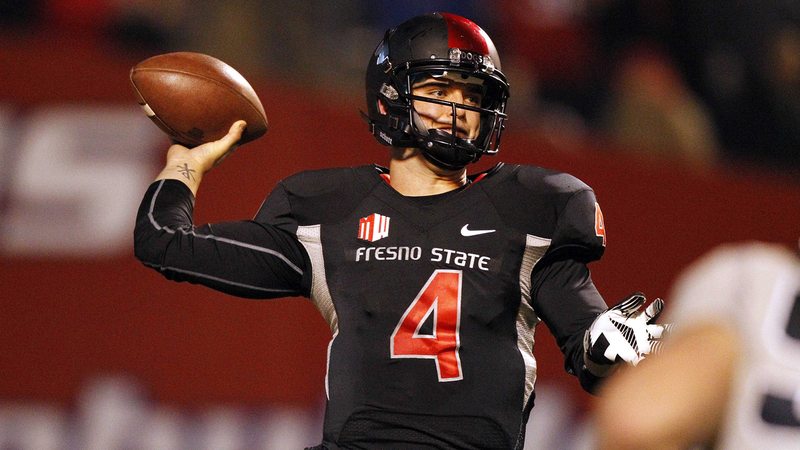 Would Texans consider drafting another Carr at QB? In the 2002 NFL Draft, the expansion Texans selected quarterback David Carr out of Fresno State with the No. 1 overall pick. Unfortunately, Carr ended up mostly being a bust during his five years in Houston, with the two sides parting ways after the team picked up Matt Schaub from the Atlanta Falcons after the 2006 season. So after one failed experiment with a Carr in Houston, would the Texans consider drafting his younger brother, Derek, 12 years later? If the younger Carr has his way, he would like to join the team his brother once played for. "Absolutely. I’d love to play for the Texans," Carr told the Houston Chronicle. "They have a great team. They have a great offensive line – one of the best tackles in the game (in Duane Brown). I’ve thrown to Andre (Johnson) before, so the timing should be OK."
Carr recalled times from his childhood spending time at Texans’ practices catching passes from his older brother and does admit he would have some resentment if Houston does pass over him. "If I am available, they’re going to get even more of a chip on my shoulder than there already is," Carr said. Houston is expected to take a quarterback in the upcoming draft, and it does have the first overall pick, and it is not out of the question for the team to trade down from the top spot, making it more likely that Derek could end up with the Texans as he is expected to be a late first-round or early second-round pick. The question is, are Texans fans ready to have another Carr at starting quarterback, even if he turns out to be more of a success than his brother, David?